Fire is being used from the dawn of the civilisation and we know this, by seeing different illustrations of flames and fire that are craved in the walls of caves. So, this is not something new to the mankind and but it always amazes us from time to time. Kids would love this drawing as it is very simple and quite serene and it carves the path for imagination and opens the possibilities for sensing more similar drawing, which a kid or student would then try to make it by themselves. 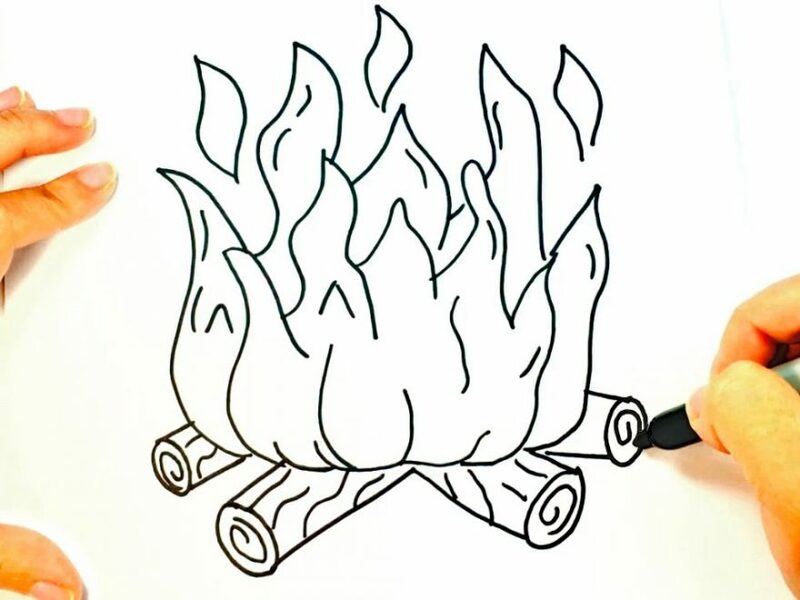 Every kid is fascinated by the camp fire, so in this tutorial we will sketch the fire upon the logs which makes the perfect campfire and jolts the energy in the kids. If you are a lover of the art then, you are gonna love this one, because it is a simple and serene drawing which you can make easily and it gives a great look. So, without wasting any more time, let’s look at all the steps by which you can make the fire easily. Step 2- Inside the rectangkes, strokes some lines from edges to the middle and you can also make few enclosed triangle in the middle. remember to use the lines by free hand. Step 4- Join the lines with the circle or curvy lines to make an oval shape in the end of the lines. Step 5 Now draw a half circle in the middle of the drawing, and some spirals in the circle of the stick. Step 9- Add more such flames in the middle of the fire, so that it looks glazing. Step 11- Erase extra lines from your glazing flames. Step 12- Draw two more flames just like the drawing mentioned below. Step 13- Draw one more set of log just in between the logs and flames. Step 14- Now erase the lines, that overlaps the logs. Step 15- Now it’s time to give your logs some barks, so add some curvy lines, spirals or triangles, to the log. Step 16- It’s time to provide base to our campfire. So, simply add horizontal lines across fire and draw some small lines parallel to horizontal line. Step 17- Now it’s time to add colour to your imagination. Do it as you like it. Generally the logs get the brown texture and the flames ranges from orange to yellow to red and blue. Not only this, here’s the video of step by step making of the fire. Find it and know more about the art of drawing the fire by yourselves. I hope you liked this part, and if so, then kindly share this link and help us bring you more.